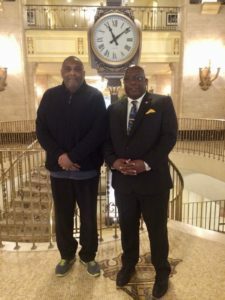 Basseterre, St. Kitts – St. Kitts and Nevis Prime Minister the Honourable Dr. Timothy Harris is featured in Share Newspaper and its online publication Sharenews.com, where he expounds upon a number of issues pertinent to the development of the federation. Share, a weekly community newspaper that has been serving the black and Caribbean communities in the Greater Toronto Area (GTA) of Ontario, Canada, since April 9, 1978, brands itself as being one of Canada’s largest and most influential ethnic newspapers. In the Nov. 9 article, headlined “Caribbean leaders want Canada to re-engage with the region” and written by journalist Ron Fanfair, Harris discussed a wide range of issues, including reforming and rebranding the country’s Citizenship by Investment (CBI) Program and increasing the federation’s diplomatic presence in Canada. Prime Minister Harris also discussed Caribbean leaders’ efforts to advance the agenda of climate change in light of the recent Category 5 hurricanes that severely impacted several islands in the region. Harris conducted the interview on the heels of the Toronto Global Forum, which is an international conference fostering dialogue on national and global issues. During that Oct. 30-Nov. 1 forum, Harris addressed the importance of building climate resilient infrastructure in small island states. St. Kitts and Nevis lost its visa-free status with Canada effective Nov. 22, 2014, after the Canadian government expressed some discomfort with the conduct of the former Dr. Denzil Douglas-led government concerning its administration of the Citizenship by Investment (CBI) program. Since winning the general elections on Feb. 16, 2015, Prime Minister Harris’ Team Unity administration has not wavered in its commitment to reform the program through, among other things, enhancing cooperation and dialogue with key international partners such as Canada. St. Kitts and Nevis’ Citizenship by Investment (CBI) program recently received top scores in the latest CBI Index for the program’s comprehensive due diligence procedures, conducted by Professional Wealth Management (PWM), a publication from the Financial Times.